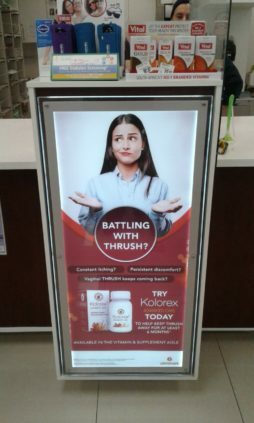 In-store advertising specialists Smart Media have assisted South African distribution and wholesale healthcare organisation Glenmark Pharmaceuticals to increase awareness of the Kolorex anti-fungal complementary medicine at Dis-Chem retail outlets through an innovative product campaign. “Even though Kolorex is an effective product, we needed to get more consumer interaction with the brand. Fungal infections are a sensitive topic especially when it comes to vaginal thrush. People are hesitant to engage with pharmacists in a public space on matters of such a personal nature. We therefore required a way to not only bring attention to the advantages of using Kolorex but educate consumers, so they could ask for it by name,” says Jualette van Gerve, product specialist at Glenmark Pharmaceuticals. Glenmark had an existing relationship with Smart Media and invited them to provide several proposals and recommendations on bringing Kolorex to the market in more exciting ways to engage with customers. “The campaign needed to inform and incorporate a call to action that would provide consumers with the peace of mind they needed to request the product from the pharmacist without having to go into details of their symptoms. To this end, we developed unique dispensary posters and lightboxes that would transform the way people looked at Kolorex,” says Cecil Ungerer, head of sales at Smart Media. The campaign ran over two months (June to July this year) at Dis-Chem stores throughout South Africa. “It was a really eye-catching way of increasing awareness. People came to collect their scripts and they would see the campaign. Over the eight weeks that Smart drove awareness, we saw a great increase in sales and could not be happier. Furthermore, Dis-Chem was also very pleased with the results of the Kolorex initiative,” says van Gerve. Ungerer agrees. “The chosen mediums have been very effective to achieve results in what would ordinarily be quite difficult conversations to have. We really wanted to showcase the product benefits in a visually interesting but still informative manner,” he says. For van Gerve, the relationship with Smart Media also stood out as a success. “From start to finish, Cecil and his team were very accommodating to our requirements. The return on exposure was very good for us and we will be using Smart Media for future campaigns. They really went the extra mile to ensure we were satisfied with the value proposition. Ultimately, the improved brand awareness for Kolorex can be considered a great success,” she concludes. This article was first published by Amplifier.